If you are an IT professional or a security consultant who wants to maximize the success of your network testing using some of the advanced features of Kali Linux, then this book is for you. This book will teach you how to become an expert in the pre-engagement, management, and documentation of penetration testing by building on your understanding of Kali Linux and wireless concepts. 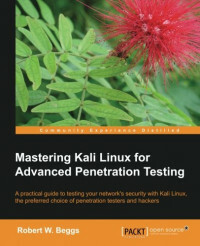 Mastering Kali Linux for Advanced Penetration Testing will teach you the kill chain perspective in assessing network security—from selecting the most effective tools, to rapidly compromising network security, to highlighting the techniques used to avoid detection. This book will take you, as a tester, through the reconnaissance, exploitation, and post-exploitation activities used by penetration testers and hackers. After learning the hands-on techniques to perform an effective and covert attack, specific routes to the target will be examined, including bypassing physical security. You will also get to grips with concepts such as social engineering, attacking wireless networks, web services, and remote access connections. Finally, you will focus on the most vulnerable part of the network—directly attacking the end user. This book will provide all the practical knowledge needed to test your network's security using a proven hacker's methodology.